A formal, informative and elegant coding style for matlab codes. %ONE Complete help comment of function. %   description to a standard logical value. %      1, true, &apos;debug&apos;, &apos;test&apos;. %      0, false, &apos;release&apos;, &apos;run&apos;. Using this CheckDebugState function, the debugging code can be separated from general code. 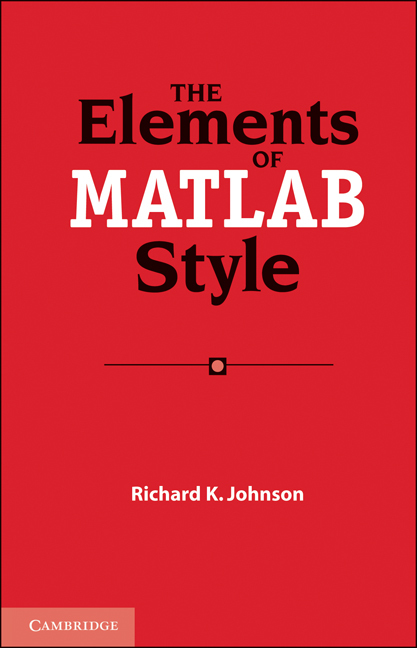 Richard Johnson has published a book “The Elements of MATLAB Style” (also see wiki) 2010. I find this one useful as it is a total pain having to trail far off to the right in any editor, even though it is possible. This helps keep sanity when working among a group with possibly different editing environments. This makes code much easier to read, understand, and debug, if necessary. Since functions perform an action, the name should include information about the action. If you have many similar files of data, having a rational numbering scheme can only help you out. I have found that generally, writing cryptic code buys less than I expect in terms of good things, and more headaches than it warrants. On occasion, I have used cryptic code for performance in something time-critical. When I do, I try to comment it fully, including a straight-forward implementation in the comments which I have tested. That way, when the performance trade-offs change, I understand what the code is supposed to do and have two starting options for doing a code update. I would say this even more strongly myself. There are superior techniques for dealing with information you want to share, whether they be function handles, classes and their properties, or some other methods. These techniques are much safer to use for many reasons - e.g., more easily controlled side effects, should any be desired, and code becomes more suitable for parallelism potentially. Clarity of meaning is paramount, especially if others need to understand, modify, or translate the code. I’m sure it doesn’t seem so to some MATLAB users, but eval is avoidable most of the time. These entries contain some useful thoughts on dealing with conditional constructs, the ordering of the cases, etc. I love that Richard has made testing a central tenet of this style guide. I don’t see how programmers function well without a robust test suite.